A collection of homilies, or familiar explanations of the biblical gospels. From a very early time the homilies of the Catholic Fathers were in high esteem, and were read in connection with the recitation of the Divine Office (a duty accomplished for God). That the custom was as old as the sixth century we know from the fact that St. Gregory the Great refers to it, and that St. Benedict mentions it in his rule. A collection, or book, of homilies. 1. 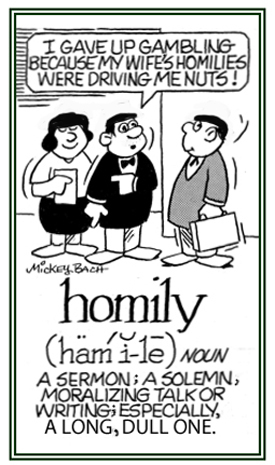 Relating to, or in the style of, a sermon or homily. 2. A reference to the art of writing and preaching sermons. 1. The art of writing and preaching sermons. 2. The branch of theology that deals with sermons and homilies. A hatred of sermons: People strongly affected by homilophobia avoid going to church and even talking to others about religious topics or morals. 1. A sermon or other piece of writing on a moral or religious topic: A preacher's homily is especially intended to edify a congregation on a practical matter and not intended to be a theological discourse. 2. A tedious moralizing lecture or admonition: Mrs. Smart gave her class a homily and reprimanded them at the beginning of the lesson since a few of them certainly were behaving badly towards others because of mobbing and stealing. 3. A platitude or saying that stimulates the mind in regards to intuition and insight: One homily, or obvious remark, is "patience is a virtue" which has been stated uncountable times, and has become quite common and banal. © ALL rights are reserved.